hoodies t-shirts tank tops woot! I am thrilled to announce that I've restocked with Día del Perro apparel, so hoodies, t-shirts and tank tops are now available at the Lucky Dog Hot Sauce website! Just click "Lucky Dog apparel" on the right hand side of the page to get the award-winning Día del Perro label by Robin Case on a high quality garment of your choice! Hot Sauce Guy in the Día del Perro t-shirt, with Jessica H, rockin' the women's tank! Hoodies are extra cool with the classic dog/horseshoe on the front & the stunning Día del Perro label on the back! Special offer: Starting now through midnight Pacific time on November 2nd, 2014 purchase any 2 shirts or 1 hoodie and get a bottle of Día del Perro with your order free of charge, with no additional shipping cost! All sizes are available, but quantities are limited so don't wait! Edited by Lucky Dog Hot Sauce, 08 October 2014 - 11:07 AM. Are you selling apparel at the FM? I be liking that black hoodie. Not shipping to the Unitrd Provinces of Canada? I have lots - won't be back at my markets until the 18th-19th though as I'll be at a festival in SCAL this weekend. I offered international shipping the 1st year I was in business - and kept getting flame-mail about how expensive shipping was. Like I control the rates. So I turned off international shipping. Perhaps you have a friend in the northern US who you could ship it to as a t-shirt sherpa? Hmmm, scratch and lick t-shirts. That might just be the next big thing lol. But seriously, great looking shirts! Thanks - 8-color screened shirt on heavy cotton. I have 3 for myself and I love the quality - the image stops people in their tracks. Robin Case is amazing - her label art rocks. In honor of the Giants advancing to the NLCS, all orders received until midnight tonight (pacific time) will receive a free bottle of Orange Label with no additional shipping charge! No minimum qty - order a bottle of Green Label, get a bottle of Orange Label. Order a shirt & a hoodie? Get a bottle of Dia & a bottle of Orange - that's right, the sale stacks! Edited by Lucky Dog Hot Sauce, 08 October 2014 - 10:00 AM. Well Duh! my daughter in Vancouver has a PO box in Pt. Roberts WA. .. Thanks Tim.. Ps I just throw my stiuff for the states in the mail ..it takes a bit longer but way cheaper , no brokers and [don't tell anybody] you often get skipped by customs and excise. points for trying , site field would not let me pay from Canada . It's not such a small world after all. Edited by tim storey, 10 October 2014 - 01:57 PM. Heavy grade cotton! Steller shirt people. BTW I ordered a shirt from another vender and got a shirt that was/is no where near the guality of LDHS shirts. The logo for LDHS new shirt really pops and makes even me look like a stud. Hey Scott, I say that picture goes somewhere on your website. For sure! Every couple months I post up a "customer submitted photos" post - this one will absolutely be there! Also tagged with one or more of these keywords: hoodies, t-shirts, tank tops, woot! 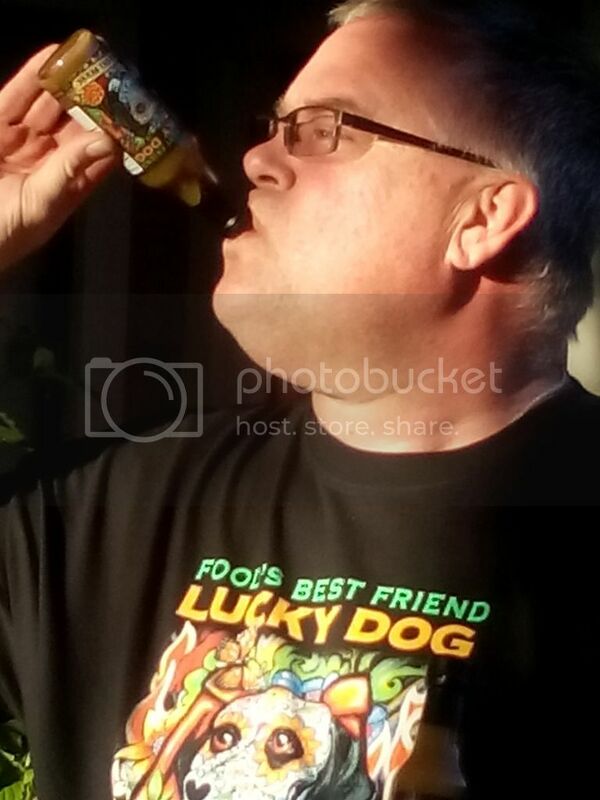 Great $5 Lucky Dog Hot Sauce Collectible available!